On June 20, I had the opportunity to go on a tour of the PECO Energy Company‘s green roof on Market Street in Philadelphia. This monthly tour is offered by the Pennsylvania Horticultural Society and includes a short film and lecture from the observation deck. 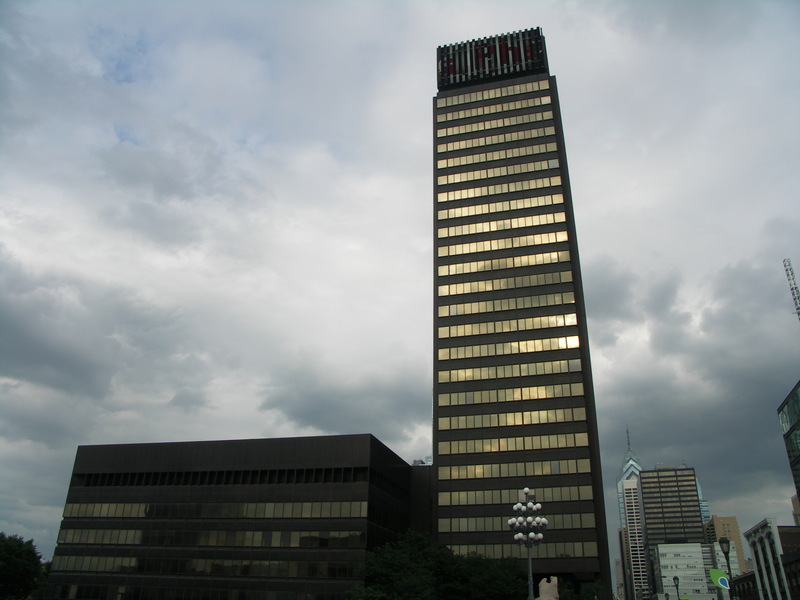 When you hear people mention “the PECO Building” in downtown Philly, most people will think of the tall tower that displays the scrolling message. But the green roof is not on the taller, south tower, but on the shorter, north tower (see photo on the right). The north building was built in 1916 but didn’t receive its green roof until winter 2008-2009. Although the top/9th floor of the north building was initially considered for solar panels, the proximity and height of the south tower (29 floors) causes shadows that would have made solar panels inefficient. The PECO building is one of 168 green roofs in Philadelphia that work towards providing the city the following benefits: stormwater absorption, reduced temperatures, cleaner air, longer roof life (it is said that a regular roof will last 20-25 years, while a green roof will last 50 years), greater indoor comfort, habitat creation, and better aesthetics. 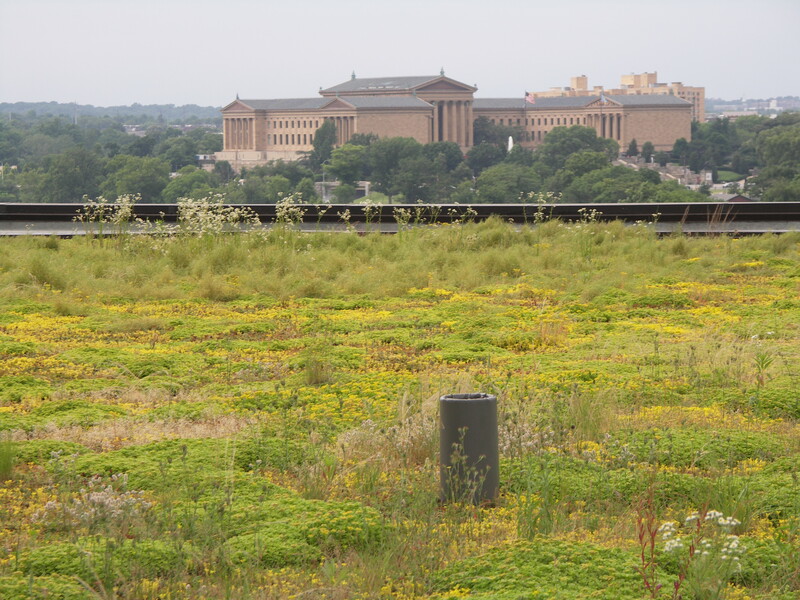 The Philadelphia Water Department gives incentives for green roofs to be installed, as the roofs capture water during peak floods and reduce/eliminate runoff into the Schuylkill River and other waterways. 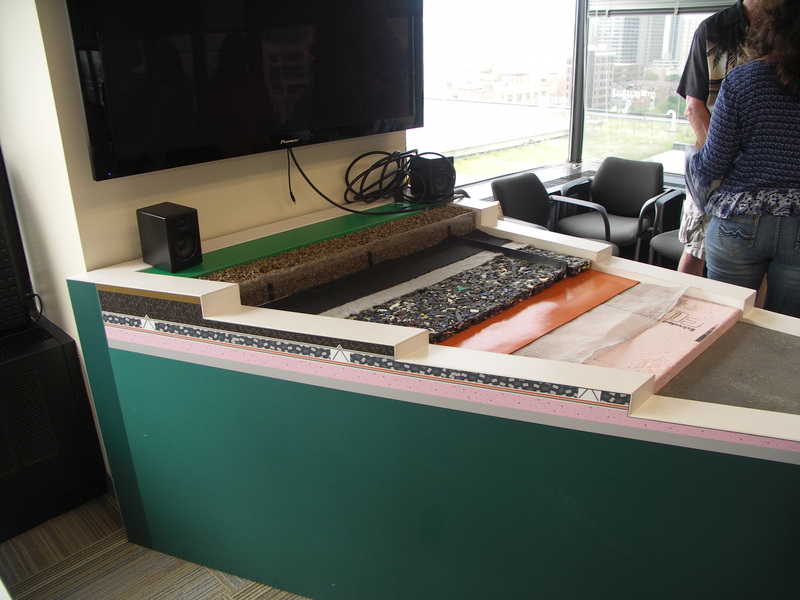 To retrofit the 45,000 square foot roof, several layers of material needed to be laid down (model to the left), starting with an electromagnetic copper wire layer to alert PECO if a leak in the layers above were to occur, an orange waterproofing PVC material, then a one-inch think mat made from recycled sneakers to act as a drainage layer, another mat to hold the three inches of soil placed on top, with a final roll of mat that is the ground cover. The cost for this green roof installation was $2 million and the plants are maintained by the Pennsylvania Horticultural Society (PHS). All of the plants are native to the area, tolerate wind/rain/drought, and have wide and shallow root systems. PHS installs new plants each season which changes the “plant palette” – a palette that is also changed by birds that bring in grasses and other seeds. Here some close-up photos of the native plants on the PECO green roof. It was fascinating to see and hear about the PECO green roof. I encourage others to sign up for this one-hour program, and to check out the other green roofs in the city. Our guide told us that the parking garage at the Philadelphia Art Museum (which we could view across the way) has a green roof (the “roof” is at ground level) – that’s on my list to check out next!